Finally, Korean winter is here complete with chilly winds that were noticeably absent during the sweltering summer along with the occasional snow storm. It’s still not as bad as back home in Chicago, and I’m glad that I grew up in the crucible of Chicago winters it since it seems like a piece of cake in Korea so far. However, I don’t mind going to new restaurants that make me forget about the cold and instead feel all warm and fuzzy inside. 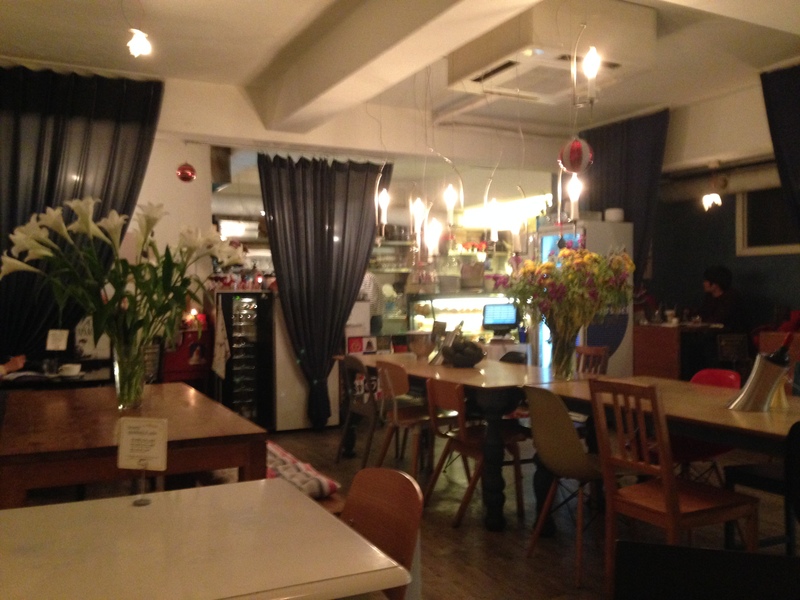 This is how I could describe my dining experience at the Flying Pan in Itaewon in Seoul. It’s quite easy to get there. You just go to the Itaewon metro stop and go out exit two. Walk out straight until you see the Ctrl A on your left hand side. Make a left on that street, and after walking straight for a minute, you’ll see the Flying Pan’s stairway leading down to the entrance. First off, I knew was going to have a great time there simply based off the name of the establishment because it’s a linguistic pun. With many Far East Asian languages like Japanese, Chinese, and Korean, it is difficult for native speakers to differentiate between the letters “L” and “R” while pronouncing words. 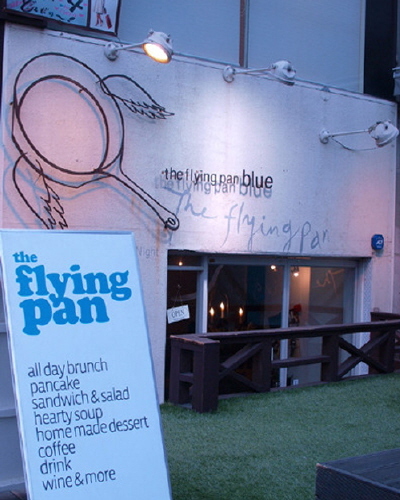 Therefore, the logo of the restaurant is a flying frying pan. I don’t know if they did that on purpose or not, but I think it’s genius. As for the decor, it’s a cozy little dining nook that could almost double as someone’s living room complete with couches, pillows, and decorative vases. 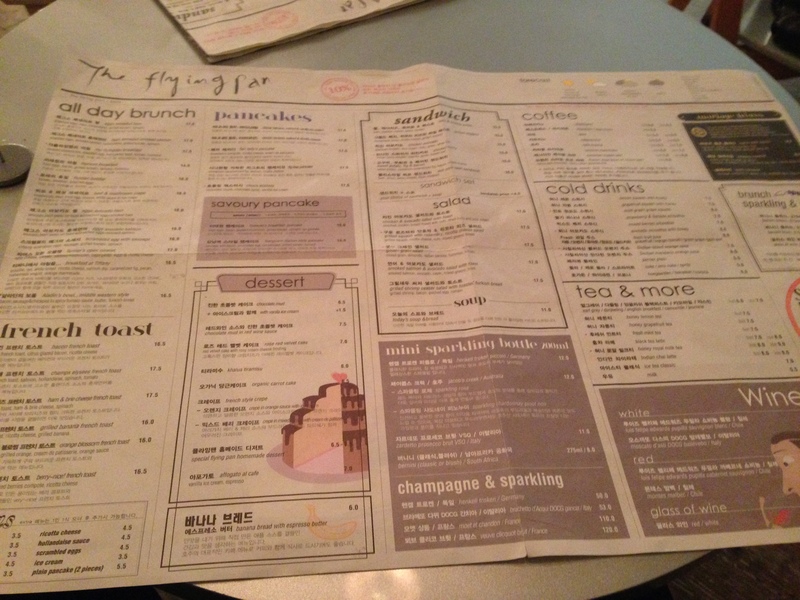 I took it all in along with the gigantic menu while waiting for my friend, Bora. I could see that they had brunch options all day along with French toast, pancakes, omelets, and sandwiches. It’s not cheap which is typical for foreign fare in Korea with a range of prices from 14,000 W to 25,000 W. Eventually, Bora joined me, and we made our choices. I went with the bacon French toast (15,000 W), and she got the farmer omelet (17,000 W). Mine came out first, and I thought they could have done a bit better on the presentation instead of the slapdash creation that lay in front of me. Then again, I could really care less what it looks like as long as it’s delectable, and boy oh boy was this French toast tres magnifique. Most people associate French with being the language of love, and I think I needed a private moment with this mademoiselle. Not only did it have a soft, brioche battered body, but it was further enhanced with some non-crispy bacon that was flung about its shoulders like some form of pork boa sans feathers. The syrup was standard maple syrup, but one big surprise was the hunks of pale yellow spread that I originally thought were globs of butter. I’m not a big fan of butter on my pancakes or French toast, but I tried some of it just to be sure. Good thing I didn’t neglect them because they turned out to be nuggets of cream cheese. What’s more French than putting some delicious cheese on some quality, fried bread? The other big surprise was the secret stash of apricot marmalade that was lurking between the folds of the toast which went quite well with the smooth sweetness of the syrup and eggy-goodness of the French toast. The strawberries were fresh and slightly tart and were the proverbial cherries on top of the masterpiece. As for Bora’s omelet, I tried a couple bites and then a couple more as she put more on my plate since I was still hungry/she’s a sweetheart. The eggs were fluffy and seemingly infused with a slightly strong tasting white cheese possibly an aged Camembert. 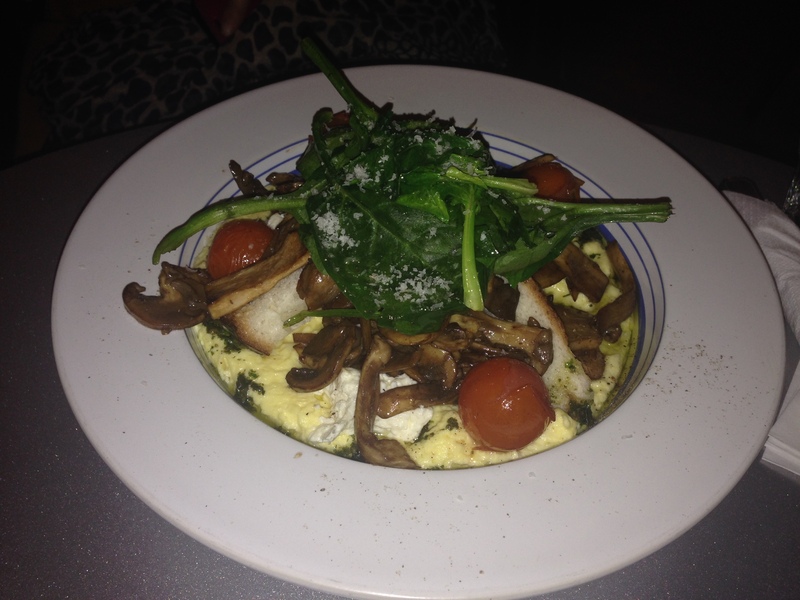 It was eggcellent with the grilled greens on top along with the sauteed mushrooms and roasted cherry tomatoes. 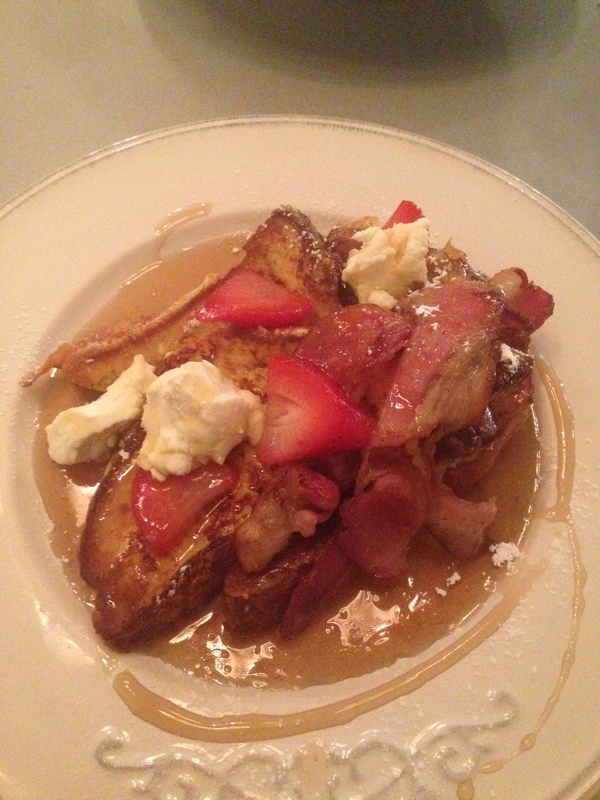 We left the restaurant for some adult libations, but my pain perdu would not be lost on me. Definitely in the pantheon of top three best breakfast meals I’ve ever eaten…for dinner. So, if you’re looking for some wonderful breakfast that doesn’t really have the greasy spoon prices but plenty of quality flavors, jet on down to the Flying Pan. You’ll be over the moon once you’ve tried it. Posted in American Cuisine, Breakfast and tagged bacon, cream cheese, Flying, French toast, greens, Korea, omelet, pan, Seoul, syrup, tomatoes. Bookmark the permalink. I hate to disagree with you my friend, or maybe because it was what I ordered, but I had a terrible experience at the Flying Pan. Their Eggs Benedict hollandaise sauce was actually chunks of butter. That said, glad you had a better experience. I found the service to be quite prompt, and the food delicious as you already read. I’d definitely recommend trying something else before completely “panning” this restaurant. Yep, it was definitely a different French toast that I’m normally used to.